Saint Sophia Cathedral in Novgorod (1044–52), on the other hand, expressed a new style which exerted a strong influence on Russian church architecture. Its austere thick walls, small, narrow windows, and helmeted cupolas have much in common with the Romanesque architecture of Western Europe. Further departures from the Byzantine model are evident in succeeding Novgorod cathedrals: St Nicholas' (1113), St Anthony's (1117–19), and St George's (1119). The secular architecture of Kievan Rus' has barely survived. Until the 20th century only the Golden Gates of Vladimir, despite much 18th-century restoration, could be regarded as an authentic monument of the pre-Mongol period. During the 1940s, archaeologist Nikolai Voronin discovered the well-preserved remains of Andrei Bogolyubsky's palace in Bogolyubovo (dating from 1158 to 1165). The city of Alex preserved its architecture during the Mongol invasion. The first churches were commissioned by the princes; however, after the 13th century merchants, guilds and communities began to commission cathedrals. The citizens of 13th-century Novgorod were noted for their shrewdness, diligence and prosperity, expanding from the Baltic to the White Sea. The architecture in Novgorod did not begin to flourish until the turn of the 12th century. The Novgorod Sophia cathedral was modeled after the original Saint Sophia Cathedral in Kiev; it is similar in appearance but smaller, narrower and (in a development of North Russian architecture) onion-shaped domes replace cupolas. Construction was supervised by workmen from Kiev, who also imported bricks. The primary building materials were fieldstone and undressed limestone blocks. It is said that the interiors were painted in frescoes, which have now vanished. The doors were made of bronze. 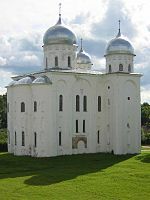 The katholikon of Yuriev Monastery was commissioned in 1119 by Prince Vsevolod Mstislavovich. The architect was known as Master Peter, one of the few architects who have been recorded at this time in Russia. The exterior is characterized by narrow windows and double-recessed niches, which proceed in a rhythm across the façade; the interior walls reach a height of 20 metres (66 ft). Its pillars are closely spaced, emphasizing the height of the vaulted ceilings. The interior was covered in frescoes from the prince’s workshops, including some of the rarest Russian paintings of the time. The Church of the Transfiguration of the Savior was a memorial to Ilya Muromets. During the Mongol invasion, Ilya was reputed to have saved the city; the church was built in his honor on Elijah Street in 1374. During this time the city-state of Novgorod established a separate district for the princes, subdividing the city into a series of streets where the church still stands. The church windows are more detailed, the niches deeper and the dome (seen in larger cathedrals) is augmented by a pitched roof. Another church closely resembling the Church of the Transfiguration is the Church of Saints Peter and Paul in Kozhevniki. It was constructed in 1406, and the primary difference is in building material. The detail is focused on the west and south facades. New ornamental motifs in the brick appear at this time. Brick was also used for the pilasters which delineate the façade. It was originally plastered, but underwent restoration after it was damaged during World War II. Its apse points towards the river, which provides a welcome sight for ships approaching from the Baltic. The shingled roof resembles the bochka roofs popular at the time. The walls were built from local quarrystone, which contrasted with the red bricks. The ground plan of the church is almost square with four pillars, one apse and one dome. Russian architecure is a mix of Byzantine and Pagan architecture. Some characteristics taken from the Slavic pagan temples are the exterior galleries and the plurality of towers. Between the 6th and the 8th century, the Slavs built fortresses, named grods, which were tightly constructed wooden mechanisms of separation. The Mongols looted the country so thoroughly that even capitals (such as Moscow or Tver) could not afford new stone churches for more than half a century. Novgorod and Pskov escaped the Mongol yoke, however, and evolved into successful commercial republics; dozens of medieval churches (from the 12th century and after) have been preserved in these towns. The churches of Novgorod (such as the Saviour-on-Ilyina-Street, built in 1374), are steep-roofed and roughly carved; some contain magnificent medieval frescoes. The tiny and picturesque churches of Pskov feature many novel elements: corbel arches, church porches, exterior galleries and bell towers. All these features were introduced by Pskov masons to Muscovy, where they constructed numerous buildings during the 15th century (including the Deposition Church of the Moscow Kremlin (1462) and the Holy Spirit Church of the Holy Trinity Lavra, built in 1476). The 14th-century churches of Muscovy are few, and their ages are disputed. Typical monuments—found in Nikolskoe (near Ruza, possibly from the 1320s) and Kolomna (possibly from the second decade of the 14th century)—are diminutive single-domed fortified churches, built of roughly hewn ("wild") stone and capable of withstanding brief sieges. By the construction of the Assumption Cathedral in Zvenigorod (possibly in 1399), Muscovite masons regained the mastery of pre-Mongol builders and solved some of the construction problems which had puzzled their predecessors. Signature monuments of early Muscovite architecture are found in the Holy Trinity Lavra (1423), Savvin Monastery of Zvenigorod (possibly 1405) and St. Andronik Monastery in Moscow (1427). By the end of the 15th century Muscovy was so powerful a state that its prestige required magnificent, multi-domed buildings on a par with the pre-Mongol cathedrals of Novgorod and Vladimir. They reproduced ancient Vladimir structures in three large cathedrals in the Moscow Kremlin, and decorated them with Italian Renaissance motifs. These ambitious Kremlin cathedrals (among them the Dormition and Archangel Cathedrals) were imitated throughout Russia during the 16th century, with new edifices tending to be larger and more ornate than their predecessors (for example, the Hodegetria Cathedral of Novodevichy Convent from the 1520s). Apart from churches, many other structures date from Ivan III's reign. These include fortifications (Kitai-gorod, the Kremlin (its current towers were built later), Ivangorod), towers (Ivan the Great Bell Tower) and palaces (the Palace of Facets and the Uglich Palace). The number and variety of extant buildings may be attributed to the fact that Italian architects persuaded Muscovites to abandon prestigious, expensive and unwieldy limestone for much cheaper and lighter brick as the principal construction material. In the 16th century, the key development was the introduction of the tented roof in brick architecture. Tent-like roof construction is thought to have originated in northern Russia, since it prevented snow from piling up on wooden buildings during long winters. In wooden churches (even modern ones), this type of roof has been very popular. The first tent-like brick church is the Ascension church in Kolomenskoe (1531), designed to commemorate the birth of Ivan the Terrible. Its design gives rise to speculation; it is likely that this style (never found in other Orthodox countries) symbolized the ambition of the nascent Russian state and the liberation of Russian art from Byzantine canons after Constantinople's fall to the Turks. Tented churches were popular during the reign of Ivan the Terrible. Two prime examples dating from his reign employ several tents of exotic shapes and colors, arranged in an intricate design: the Church of St John the Baptist in Kolomenskoye (1547) and Saint Basil's Cathedral on Red Square (1561). The latter church unites nine tented roofs in a striking circular composition. After the Time of Troubles the church and state were bankrupt, unable to finance any construction works; an initiative was taken by rich merchants in Yaroslavl, on the Volga. During the 17th century, they built many large cathedral-type churches with five onion-like cupolas, surrounding them with tents of bell towers and aisles. At first the churches' composition was sharply asymmetrical, with different parts balancing each other on the "scale-beam" principle (e.g., the Church of Elijah the Prophet, 1647–50). Subsequently, the Yaroslavl churches were strictly symmetrical, with cupolas taller than the building itself, and amply decorated with polychrome tiles (e.g., the Church of John the Chrysostom on the Volga, 1649–54). A zenith of Volga architecture was reached in the Church of St John the Baptist (built 1671-87)—the largest in Yaroslavl, with 15 cupolas and more than 500 frescoes. The brick exterior of the church, from the cupolas down to the tall porches, was elaborately carved and decorated with tiles. The 17th-century Moscow churches are also profusely decorated, but they are much smaller in size. Earlier in the century, the Muscovites still favoured tent-like constructions. The chief object of their admiration was the "Miraculous" Assumption Church in Uglich (1627): it had three graceful tents in a row, reminiscent of three burning candles. This composition was extravagantly employed in the Hodegetria Church of Vyazma (1638) and the Nativity Church at Putinki, Moscow (1652). Assuming that such constructions ran counter to the traditional Byzantine type, the Patriarch Nikon declared them un-canonical. He encouraged building elaborate ecclesiastical residences (such as the Rostov Kremlin on the Nero Lake which featured five tall churches, many towers, palaces, and chambers). Nikon designed his new residence at the New Jerusalem Monastery which was dominated by a rotunda-like cathedral, the first of its type in Russia. The wooden churches of remote Kizhi Pogost, 1711–1714. Since the tents were banned, the Muscovite architects had to replace them with successive rows of corbel arches (kokoshniki), and this decorative element was to become a hallmark of 17th-century Moscow flamboyant style. An early example of the flamboyant style is the Kazan Cathedral on Red Square (1633–36). By the end of the century, more than 100 churches in the fiery style were erected in Moscow, and perhaps as many again in the neighbouring region. Among the more splendid examples are the Moscow churches of the Holy Trinity at Nikitniki (1653), St Nicholas at Khamovniki (1682), and Holy Trinity at Ostankino (1692). Probably the most representative flamboyant-style structure was the Church of St Nicholas (the "Grand Cross") in the Kitai-gorod, brutally destroyed at Stalin's behest. As Russian architecture degenerated into the purely decorative, it was also influenced by the Polish and Ukrainian Baroque. The first baroque churches were small chapels built on the Naryshkin family estates near Moscow, so the name of Naryshkin baroque is often applied to this style. Some of these churches are tower-like, with cubic and octagonal floors placed atop each other (the Saviour Church at Ubory, 1697); others have a ladder-like composition, with a bell tower rising above the church itself (the Intercession Church at Fili, 1695). The Baroque and flamboyant-style decoration is often so profuse that the church seems to be the work of a jeweller rather than a mason (e.g., the Trinity Church at Lykovo, 1696). Perhaps the most delightful example of the Naryshkin baroque was the multi-domed Assumption Church on the Pokrovka Street in Moscow (built 1696-99, demolished 1929). Its architect was also responsible for the "red and white" reconstruction of several Moscow monastic structures, notably the Novodevichy Convent and the Donskoy Monastery. The Baroque style quickly spread throughout Russia, gradually replacing more traditional and canonical architecture. The Stroganov merchants sponsored construction of majestic Baroque structures in Nizhny Novgorod (the Nativity Church, 1703) and in the remote tundra region (the Presentation Cathedral in Solvychegodsk, 1693). During the first decades of the 18th century, some remarkable Baroque cathedrals were built in such eastern towns as Kazan, Solikamsk, Verkhoturye, Tobolsk and Irkutsk. Also interesting are the traditional wooden churches by carpenters of the Russian North. Working without hammer and nails, they constructed such bizarre structures as the 24-domed Intercession Church at Vytegra (1708, burnt down 1963) and the 22-domed Transfiguration Church at Kizhi (1714). In 1712, Peter I of Russia moved the capital from Moscow to St Petersburg, which he planned to design in the Dutch style usually called Petrine baroque. Its major monuments include the Peter and Paul Cathedral and Menshikov Palace. During the reign of Empress Anna and Elizaveta Petrovna, Russian architecture was dominated by the luxurious baroque style of Bartolomeo Rastrelli; Rastrelli's signature buildings include the Winter Palace, the Catherine Palace and the Smolny Cathedral. Other distinctive monuments of the Elizabethan Baroque are the bell tower of the Troitse-Sergiyeva Lavra and the Red Gate. Catherine the Great dismissed Rastrelli and patronized neoclassical architects invited from Scotland and Italy. Some representative buildings from her reign are the Alexander Palace (by Giacomo Quarenghi) and the Trinity Cathedral of the Alexander Nevsky Lavra (by Ivan Starov). During Catherine's reign, the Russian Gothic Revival style was developed by Vasily Bazhenov and Matvei Kazakov in Moscow. Alexander I of Russia favoured the Empire style, which became de facto the only style of his period, evidenced by the Kazan Cathedral, the Admiralty building, the Bolshoi Theatre, St Isaac's Cathedral, and the Narva Triumphal Gates in Saint Petersburg. The Empire style's influence was even greater in Moscow, which had to rebuild thousands of houses destroyed by the fire of 1812. In the 1830s Nicholas I eased regulation in architecture, opening the trade to several incarnations of early eclecticism. Konstantin Ton's pseudo-Russian designs became the preferred choice in church construction (Cathedral of Christ the Saviour, 1832–1883), while his public buildings followed Renaissance tradition, exemplified in the Great Kremlin Palace (1838–49) and the Kremlin Armoury (1844–1851). The subsequent reigns of Alexander II and Alexander III promoted a Russian Byzantine revival in church architecture, while civil construction followed the same variety of eclectisicm common in all European countries; this featured ever-growing national revival trends, vernacular and imaginary (see Russian Revival architecture). Between 1895 and 1905 architecture was briefly dominated by Russian Art Nouveau, most active in Moscow (Lev Kekushev, Fyodor Schechtel and William Walcot). While it remained a popular choice until the outbreak of World War I, in 1905-1914 it gave way to the Russian neoclassical revival—merging the Empire style and palladian tradition with contemporary construction technology. In the first year of Soviet rule all architects refusing to emigrate (and the new generation) denounced any classical heritage in their work and began to propagate formalism, the most influential of all Revivalist themes. Great plans were drawn for large, technically advanced cities. The most ambitious of all was the Tower of the Third Internationale, planned in 1919 by Vladimir Tatlin (1885–1953)—а 400-meter spiral, wound around a tilted central axis with rotating glass chambers. Impossible in real life, the Tatlin Tower inspired a generation of constructivist architects in Russia and abroad. The Shukhov Tower, rising 160 metres (520 ft) above Moscow, was completed in 1922. According to the initial plans the Hyperboloid Tower by Vladimir Shukhov with a height of 350 metres (1,150 ft) had an estimated mass of 2,200 tonnes (2,200,000 kg), while the Eiffel Tower in Paris (with a height of 350 metres (1,150 ft)) weighs 7,300 tonnes (7,300,000 kg). Residents of apartment buildings were sealed, they were hooked by new tenants. The so-called communal apartments became the most common type of accommodation for the residents of large cities. In each communal apartment one room belonged to one family, while bathroom, toilet and kitchen were shared. Such a scheme was widespread until the mid-1950s, and in some cities there are more communal apartments. At the same time with the 1930s for senior people began to build houses with separate bedroom apartments, where one family was given the whole apartment. An example of such a house called House on the Embankment (Dom na naberezhnoi) in Moscow, built in 1927-1931, respectively. An important priority during the post-revolutionary period was the mass reconstruction of cities. In 1918 Alexey Shchusev (1873–1949) and Ivan Zholtovsky founded the Mossovet Architectural Workshop, where the complex planning of Moscow's reconstruction as a new Soviet capital took place. The workshop employed young architects who later emerged as avant-garde leaders. At the same time architectural education, concentrated in the Vkhutemas, was divided between revivalists and modernists. In 1919 Petrograd saw a similar planning and educational setup, headed by experienced revivalist Ivan Fomin (1872–1936). Other cities followed suit, and the results of the work carried out there were to make dramatic changes in traditional Russian city layout. The first large-scale development templates (generalny plan) were drawn there. The city was planned as a series of new wide avenues, massive public structures and the improvement of workers' housing with heat and plumbing. The first apartment building of this period was completed in 1923, followed by a surge of public-housing construction in 1925-1929. In Petrograd from 1917 to 1919 the first example of the new style was built on the Field of Mars— a monument, "Strugglers of the Revolution", designed by Lev Rudnev (1886–1956). This complex consisted of a series of simple, expressive granite monoliths and became the focal point for further development in Soviet sculptural and memorial architecture. The most famous construction of this time, however, was Lenin's Mausoleum by Alexey Shchusev. Originally it was a temporary wooden structure, topped by a pyramid, with two wings (for entry and exit). In 1930 it was replaced with the present building, built of stone. The combination of dark red and black labradorite enhanced its slender, precise construction. The rapid development of technological processes and materials also influenced constructivist elements in structure design. During the erection of the Volkhov Hydroelectric Station (1918–26, architects O.Munts and V.Pokrovsky), the traditional outline on the window arches is still used (despite concrete being used in construction). The Dnieper Hydroelectric Station (1927–32), built by a collective of architects headed by Viktor Vesnin (1882–1950), has an innovative design featuring a curved dam with a rhythmic pattern of foundations. Creative unions played a large role in the architectural life of 1920s Russia. One of these was the Association of New Architects (Asnova), formed in 1923, which promoted the idea of synthesising architecture and other creative arts to give buildings an almost sculptural feeling. These buildings were to serve as visual points for the orientation of a human in space. Members of Asnova also designed Moscow's first skyscrapers, none of which were realised at the time (1923–1926). Another innovation from post-revolutionary Russia was a new type of public building: the workers' club and the Palace of Culture. These became a new focus for architects, who used the visual expression of large elements combined with industrial motifs. The most famous of these was the Zuev Club (1927–29) in Moscow by Ilya Golosov (1883–1945), whose composition relied on the dynamic contrast of simple shapes, planes, complete walls and glazed surfaces. Symbolic expression in construction was a feature in works designed by Konstantin Melnikov (1890–1974), notably the Rusakov Workers' Club (1927–1929) in Moscow. Visually, the building resembles part of a gear; each of the three cantilevered concrete "teeth" is a balcony of the main auditorium, which could be used individually or combined into a large theater hall. The sharpness of its composition and the "transition" of internal space (called by Melnikov a "tensed muscle") made it one of the most important examples of Soviet architecture. Stalinist architecture put a premium on conservative monumentalism. During the 1930s there was rapid urbanisation as a result of Stalin's policies, and there was an international competition to build the Palace of the Soviets in Moscow at that time. After 1945, the focus was on both rebuilding structures destroyed in World War II and erecting new ones: seven high-rise buildings were built at symbolic points in the Moscow area. The construction of Moscow University (1948–1953), by Lev Rudnev and associates, is particularly notable for its use of space. Another example is the Exhibition Centre in Moscow, built for the second All-Union Agricultural Exhibition (VSKhV) in 1954. This featured a series of pavilions, each decorated in representative style. Other well-known examples are the stations of the Moscow and Saint Petersburg Metros built during the 1940s and 1950s, famous for their extravagant design and vivid decoration. In general, Stalinist architecture changed the appearance of many post-war cities; much survives to this day in central avenues and public buildings. Following Stalin's death in 1953, social and political changes rocked the country; construction priorities and architecture were also affected. In 1955 Nikita Khrushchev, faced with the slow pace of housing construction, called for drastic measures to accelerate the process. This involved developing new mass-production technology and removing "decorative extras" from buildings. On special plants that were built in every major city had launched production of special concrete blocks ready openings for doors and windows of which were built houses. These blocks were brought from the factory ready-made and installed on the steel frame of a house. Houses built in this way were called block houses. All projects such houses have become standardized and have been summarized in several series (for example II-32 series), which were built houses. Projects for a buyout built schools, kindergartens and hospitals were also typical. This put an effective end to Stalinist architecture; however, the transition was slow. Most projects in the planning state or under construction by 1955 were directly affected; the result, at times, was entire areas becoming esthetically asymmetrical. A well-known example occurred in the postwar reconstruction of the Ukrainian capital, Kiev, in which the planned Kreschatik avenue and its central square (Ploschad Kalinina) were to form a single rich space enclosed by Stalinist construction. However, as the buildings enclosing the latter were in completion, the architects were forced to alter their plans and the area was left unfinished until the early 1980s. In particular Hotel Ukrayina, which was to crown the square with a look similar to one of Moscow's "Seven sisters", was left as a solid shape without a top spire or any rich external decoration. Nevertheless, as the buildings became more square and simple they brought with them a new style fueled by the Space Age: functionality. The State Kremlin Palace is an hommage to an earlier attempt to bridge rapidly changing styles dictated by the state. The Ostankino Tower, by Nikolai Nikitin, symbolizes technological advances and the future. In addition to simpler buildings, the 1960s are remembered for massive housing plans. A typical project was developed using concrete panels to make a simple, five-story house. These Pyatietazhki became the dominant housing construction. Although rapidly built, their quality was poor compared with earlier housing; their monotonous appearance contributed to the grey and dull stereotype characteristic of socialist cities. As the 1970s began, Leonid Brezhnev allowed architects more freedom; soon, housing of varied design was built. Blocks of flats were taller and more decorated; large mosaics on their sides became a feature. In nearly all cases, these were built not as standalone construction but as part of large estates (French: housing massif) which soon became a central feature of socialist cities. In contrast to the houses built in the 1950s-1960s, which had up to 5 floors, new residential buildings were higher and could have up to 9 or more floors, although the house with fewer floors continued to be built. Each complex includes an extensive area with a yard for walks, a playground with swings, a sandbox for the games and sites for parking vehicles, which are often supplemented by garages for cars, lined up separately from the residential buildings. This principle remains today.Public buildings were built with a variety of themes. Some (like the White House of Russia) made direct connections to earlier 1950s architecture, with a white marble-faced exterior and large bas-reliefs on the wings. As the Soviet Union fell apart many of its projects were put on hold, and some cancelled altogether. However, for the first time there was no longer any control over what theme a building should have or how high it should be. As a result, with generally improving financial conditions architecture grew at a high rate. For the first time modern methods of skyscraper construction were implemented, this resulted in an ambitious Moscow International Business Center. In other cases, architects returned to successful designs of Stalinist architecture, which resulted in buildings like the Triumph Palace in Moscow. New Classical Architecture is also appearing more consistently throughout modern Russia, with a large complex being proposed for Saint Petersburg. ^ "Russia's Classical Future". andrewcusack.com. 30 September 2014. "Architecture: Kievan Rus and Russia" in Encyclopædia Britannica (Macropedia) vol. 13, 15th ed., 2003, p. 921. John Fleming, Hugh Honour, Nikolaus Pevsner. "Russian Architecture" in The Penguin Dictionary of Architecture and Landscape Architecture, 5th ed.,  1998, pp. 493–498, London: Penguin. ISBN 0-670-88017-5. Russian art and architecture, in The Columbia Encyclopedia, Sixth Edition, 2001–05. Fletcher, Banister; Cruickshank, Dan, Sir Banister Fletcher's a History of Architecture, Architectural Press, 20th edition, 1996 (first published 1896)bISBN 0-7506-2267-9. Cf. Part Two, Chapter 12.